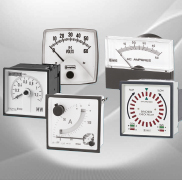 Comprehensive range of analogue instruments for measuring electrical and electronic parameters. Range includes ANSI switchboard meters, panel indicators, sealed and ruggedised instruments, and complementary selector switches for line-to-line and line-to-neutral readings. All instruments are available in a range of styles, sizes and performance specifications.